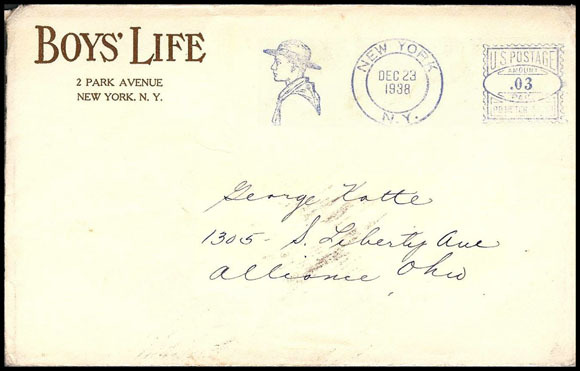 Copyright © 2010 - 2018 by Scouts on Stamps Society International, Inc. All rights reserved. 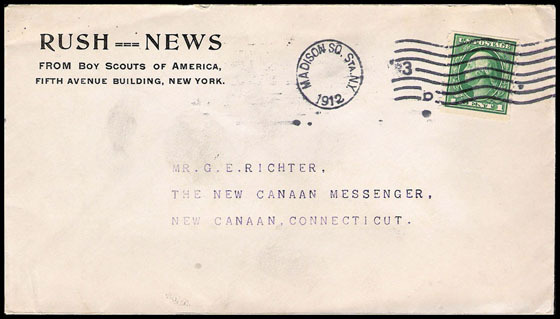 Corner Cards are stationery envelopes with "return addresses", usually in the upper left corner. Those without cachet are listed here. Example is a late usage posted from non NY location. 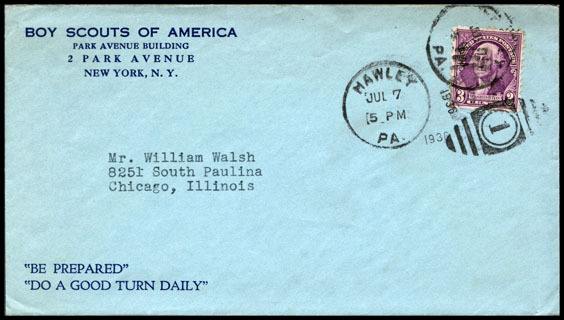 Black 4¼" x 7¾" Manila clasp envelope. 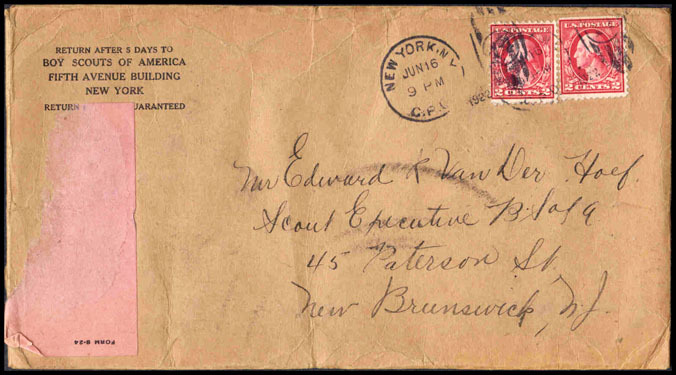 Late usage showing double rate & form S-24 shipping label remnant. 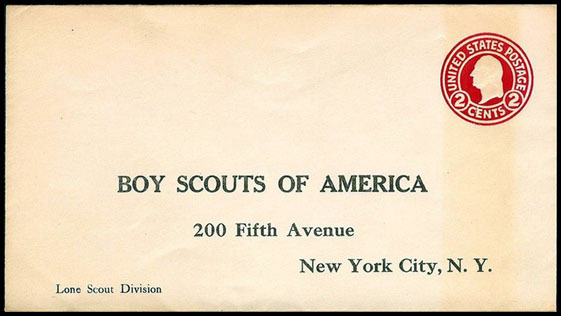 Boy Scouts of America Stationery "Do a Good Turn Daily"
Boy Scouts of America Stationery "Do a Good Turn Daily" "Be Prepared"
Type III Fifth Avenue Building New York, N.Y.
to Lone Scouts Division. See 29-1 in the Print Catalog. 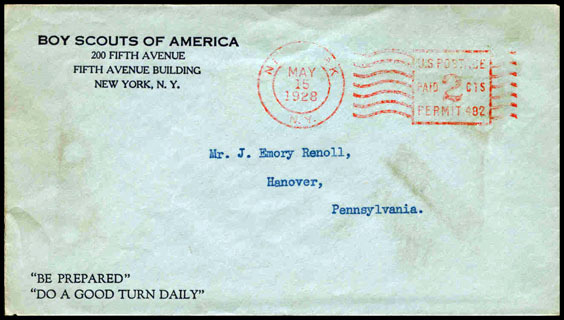 Type IIIA 200 Fifth Avenue New York City, N.Y. Type IV 200 Fifth Avenue Fifth Avenue Building New York, N.Y.
¹ Scouting Magazine, January 1928, Vol. XVI No. 1. Cover, Mast & mast page story. 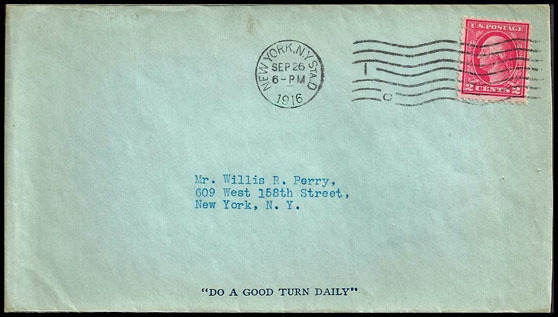 Type V Park Avenue Building 2 Park Avenue New York, N.Y.
See the back of this cover in the "Cover backs with cachets" section . 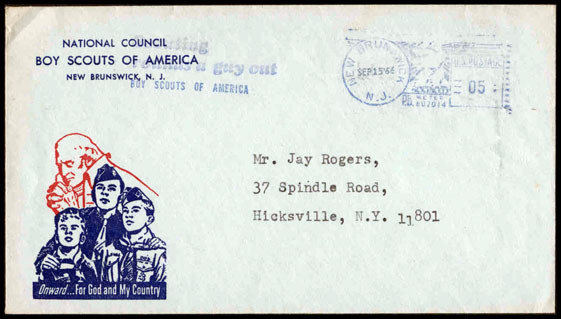 Hawley, PA is a 30 min drive from TMR, New York City's Scout Camps. 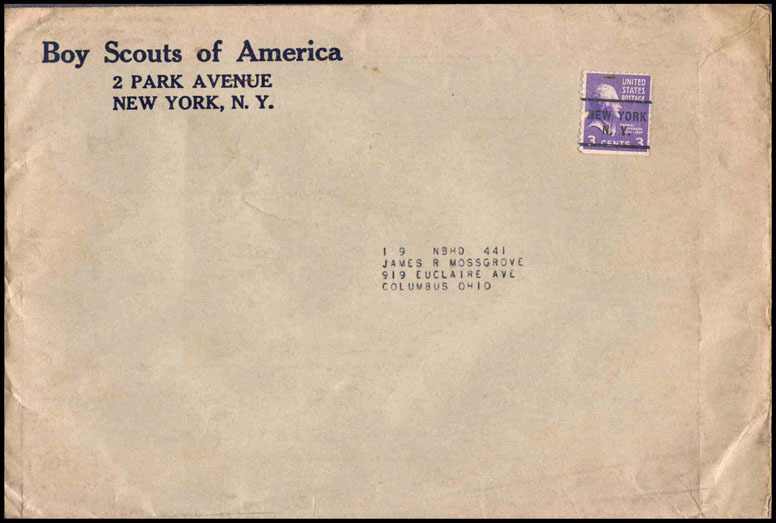 Type VI 2 Park Avenue New York, N.Y.
National Council, BSA, New York, NY Contained [folded] "Boy Scout Camp at World's Fair" poster. 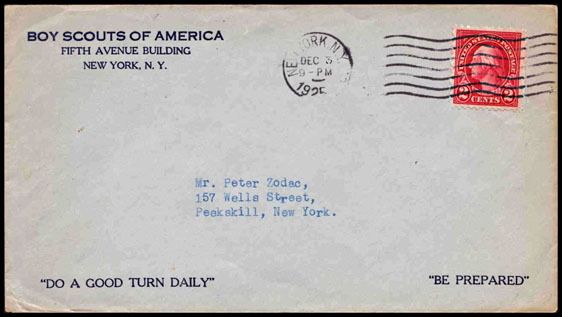 Type VII Park Avenue Building 2 Park Avenue New York 16, N.Y.
National Council, BSA, Park Avenue Building, 2 Park Avenue, New York 16, N.Y. Example Cancelled on VE Day. 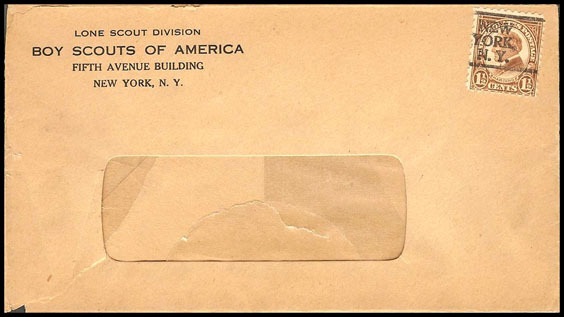 Type VIII 2 Park Avenue New York 16, N.Y. 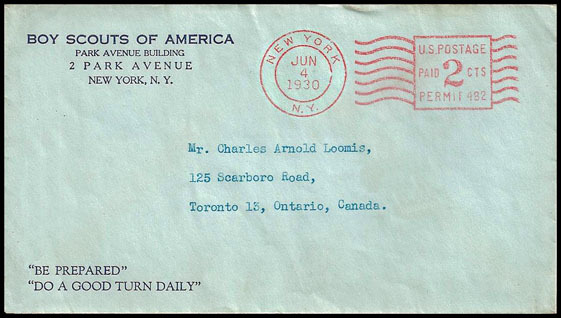 Example with early usage of "Strengthen the Arm of Liberty" slogan meter in red. 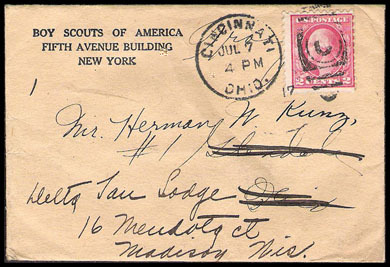 Example with early usage of "National Jamboree" slogan meter in red. 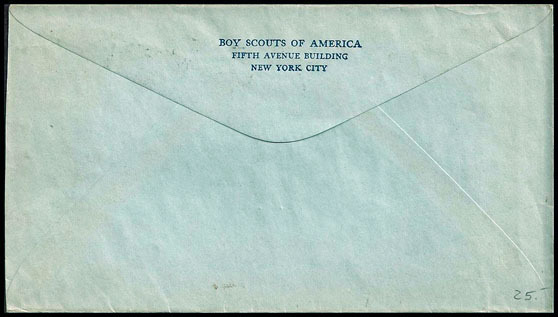 The Scout Executive is a BSA publication. 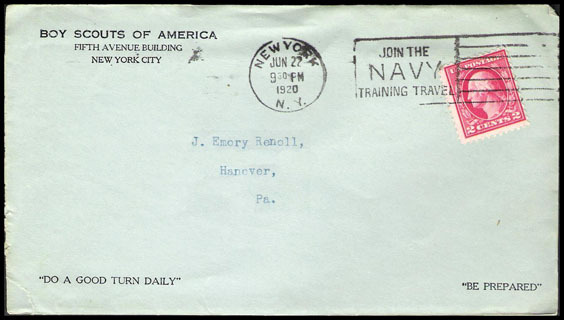 Type X National Council New Brunswick, N.J.